Scrivener - for writing on my laptop. I love it because there is a full screen mode which blocks everything out. Plus I can choose the background colour depending on my mood. Office - I never had an office, but now that I have it, I’m in love. You might consider this more of a place. But what’s the difference between a place and a tool? Do I use it? Hell ya. Sometimes I fight using it, because I know if I just sit in it, I’ll get something done. Sometimes I like being lazy. 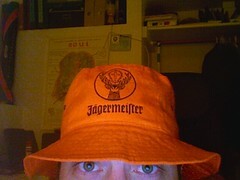 Creative hat - (see photo) not always needed, but oddly helpful. Don’t know why. Maybe it’s the orange? They say it’s a creative colour. Now these are just some of my tools. And chances are they won’t do you a lick of good. The Moleskine might be handy, but I bet you’ll use it differently then I do. My teacher, Dari, needs a classic style keyboard with weight to the keys. One that goes “clunk” and pushes back. It’s chunky and heavy. They way it needs to be for her. I’ve tried to help her on her computer from time to time, and then thing drives me nuts! But she loves it. How do you find new tool? How do you find your tools? How do you know they are still working for you?